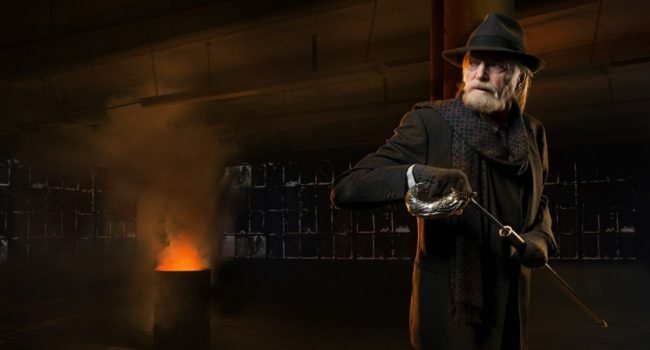 On The Strain, Professor Abraham Setrakian (David Bradley) is a Holocaust survivor who hunts the ancient strain of vampires, the strigoi, that occupied New York City. He first encountered the strigoi during WWII, at the hands of the Nazi army. Despite his age, Setrakian is steadfast and quick, thanks to his concoction of strigoi blood that extends his life and health. His most distinctive accessory is his wolf’s head sword cane, once belonging to the vampire master’s human host, which he acquired from a war criminal. The exact cane is difficult to find, though many pewter substitutes provide the same effect.